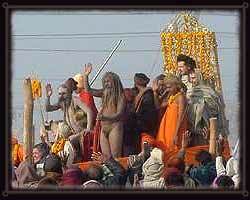 Kumbha Mela Travel Plan - Information on complete traveling arrangements for Kumbha Mela 2003 in Nashik. Upon arrival you will be met by our representative at Airport followed by a warm welcome. Transfer to Hotel. Overnight at hotel. Drive to Nasik a sacred city on the banks of the River Godavari, is now a throbbing industrial town. Its beautiful architecture, temples and caves are a mute testimony to its rich, eventful history. An ancient city, yet, one that has ridden astride the wheels of history and bears its footprints. The Egyptian historian Ptolemy (A.D. 150) had found this place a flourishing center for trade and commerce. The place abounds in temples, some of them more than two hundred years old. The Sundranarayan Temple with its richly carved and domed porticoes, its highly ornamented central dome and spire Ð all made of beautifully dressed stone is a treat for the eyes. The Kampaleshwar temple of lord Shiva wearing a skull. Temple of Balaji built on the confluence of the Godavari and the Saraswati that flows underground has copper images of Balaji, Ramadevi and Laxmi decked with valuable jewellery and Balaji wears a gold mask. The other temples of note are the Kalaram Mandir, the Goraram Mandir and the Rameshwar or Bell temple. In some temples, the lingas date back to the age of Rama. It is no wonder then that Nasik is called the Benares of southern India and the Godavari, the Ganges of the South. Drive to Trimbakeshwar. It is famous for the Trimbakeshwar Temple and source of the Godavari River. Trimbakeshwar enshrines one of the 12 jyotirlingas dedicated to Shiva and this one is considered to be the main jyotirlinga. Legend has it that Guatam Rishi performed a rigorous ritual of prayer and penance or tapasya to Shiva on Brahmagiri Hill which rises above the present-day temple. Pleased with this devotion, Shiva is said to have blessed him and brought down to earth from heaven the sacred rivers of Ganga, Gautami and Godavari. At the Kushavarta Teerth, devotees usually dip themselves into the waters and purify themselves of all sins before entering the temple. To this day, Hindus offer shraad prayers (prayers for the souls of the departed) here. It is also believed that bathing in the waters of the Godavari will bring moksha or salvation. Mondays are considered particularly holy and the priests carry the idol of Trimbakeshwar in a palanquin on their shoulders around the temple. The annual festival of Shivratri is also celebrated with great pomp and gaiety and attracts thousands of pilgrims from all over. For overnight return to Nasik. 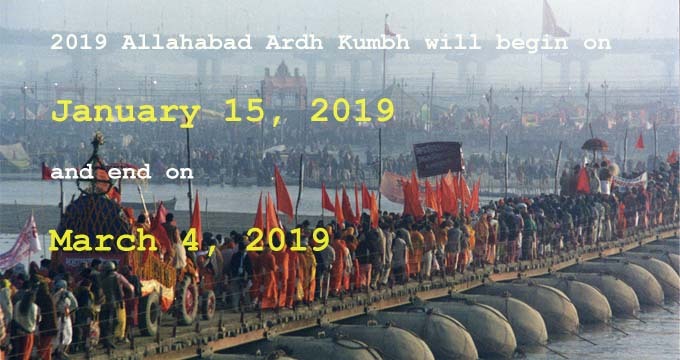 Day reserved for Kumbh at Trimbakeshwar. Overnight at hotel in Nasik. Drive to Shirdi visit Mahasamadhi temple of Sri Sai Baba. Abode of one of Maharashtra's most revered saint -- Sai Baba of Shirdi. Popularly known as the 'Child of God', Sai Baba preached tolerance towards all religions and the message of universal brotherhood. Every activity at Shirdi revolves around the vast temple complex dedicated to Sai Baba. Devotees start queuing up in the early hours of dawn to catch a glimpse and seek the blessings of the life-size statue of Sai Baba. Thursday is marked by special pujas and darshan of the Sai Baba statue. Visit Dwarkamani Mosque where the Baba meditated and slept on alternate nights. Near the mosque, in a corridor is the dhuni or eternal flame that burns day and night. Other places of importance are the Gurusthan, the Kandoba Temple, Shani Mandir, Narsimha Mandir, Changdev Maharaj Samadhi and the Sakori. Overnight Hotel. Drive to Aurangabad enroute visit Ellora caves, these caves represent 300 years of great experiments carried out by different faiths with their very different iconography and structural compulsions.The finest specimens of cave temple architecture. They house elaborate facades and exquisitely adorned interiors. These structures represent the three faiths of Hinduism, Buddhism and Jainism. The cave monuments of Ellora were chiefly patronised by the Chalukya - Rashtrakuta rulers (7th - 10th century AD). The temple building was considered to help the attainment of worldly power as well as religious merit and spiritual salvation. Overnight at Hotel. Day excursion to Ajanta caves, 2nd century BC to 6th century AD. They were hidden in the midst of a lonely glen with a streamlet flowing down below. They were scooped out into the heart of the rock so that the pious Buddhist monk could dwell and pray. These are the caves that the followers of Lord Buddha, embellished with architectural details with a skilful command of the hammer over the chisel, with sculpture of highest craftsmanship and above all, with the paintings of infinite charm. The entire course of the evolution of Buddhist architecture can be traced in Ajanta. During this time, images of Buddha interpreting his different life stories and several types of human and animal figures were carved out of rock in-situ. All sections of people of the contemporary society from kings to slaves, women, men and children are seen in the Ajanta murals interwoven with flowers, plants, fruits, birds and beasts. There are also the figures of 'Yakshas', 'Kinneras' (half human and half bird) 'Gandharvas' (divine musicians), 'Apsaras' (heavenly dancers), which were of concern to the people of that time. En-route visit Aurangabad caves also. Overnight at Hotel. Morning visit to Bibi Ka Makqbara, a mausoleum modeled on the Taj Mahal and considered the first Mughal monument in the Deccan built between 1657 and 1661 by Aurangzeb for his wife Dilras Banu Begum. Visit Daulatabad Fort, one of the oldest fort existing in India, built by a king of the Yadav dynasty called Bhilam Raja in 1187. Afternoon connect flight to Delhi (IC888 dep. 1730 arr. 2055). Transfer to hotel Overnight. Half day Delhi sightseeing. Evening transfer to airport to connect flight to Lucknow (CD7411 dep.1700 arr.1750). Lucknow is a city synonymous with the Nawabi Culture. The imperialistic splendour and magnificence of the Nawabi era has been glorified and eulogized down the ages by writers, poets and historians alike. At the same time its mystical elegance and amorous ethos has caught the fascination of many world famous romantics. Known for its adab and Tehzeeb (cultural refinement), Lucknow is also associated with its legendary hospitality, leisurely moods of life, fabled edifices steeped in history, world renowned cuisine and exquisite Sham-e-Awadh. Tremors of time have not effaced Lucknow of its cultural heritage and traditions, which once contributed in creating the city incomparable in its times. Overnight at Hotel. Full day city sightseeing includes Shaheed Smarak, Residency, BaraImambara, Chhota Imambara, and Clock Tower. The traditional embroidered cloth called chiken comes from Lucknow--great shopping opp.Evening is free to the explore the local bazaars. Overnight at Hotel. Day excursion to Ayodhya,, the birth place of Lord Rama, the hero of the epic Ramayana and incarnation of Vishnu. It is one of the seven sacred cities of Hinduism. Visit their temples, mosque and bathing ghats. This is an authentic ancient spiritual site where tourists are rarely seen. Return to Lucknow for overnight. Drive to Allahabad, situated at the confluence of the rivers Ganga, Yamuna and Saraswati. It was called Prayag during ancient times. 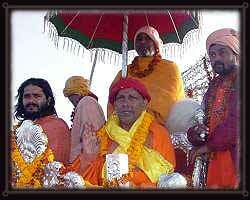 A year-round important place for pilgrimage, it assumes the form of the Kumb Mela every twelfth year. Overnight at Hotel. Morning visit the bathing ghats and Akbar Fort, built in 1583 at the confluence of the rivers Yamuna and Ganga. Ashoka Pillar in side the fort is a polished sandstone pillar which dates back to 232 B.C. It carries emperor AshokaÕs edicts engraved on it, and an inscription praising the victories of Samudragupta. After visiting drive to Varanasi. Overnight at Hotel, Palace on Ganges, situated on the banks of the Ganges by Assi Ghat. Sunrise boat-ride on the sacred Ganges, over looking the bathing and the burning ghats to observe the ancient spiritual rituals. Afterwards, a walking tour of the ghats area including a visit to Vishvanath Temple, one of the oldest temples in Varanasi dating back 1000 years, the temple is dedicated to Lord Shiva. After breakfast, excursion to Sarnath, a major Buddhist centre. Evening return to hotel Overnight. After breakfast visit Vishvanath Temple, one of the oldest temples in Varanasi dating back 1000 years, the temple is dedicated to Lord Shiva. to Delhi (IC 805 dep. 1600 arr. 1815). Transfer to hotel near to airport for wash/change followed by farewell Dinner. Late night transfer to international airport for flight to home.